Phil - Blacksburg, VA This kit is not complete "While you need everything in this "kit" to change your Ranger's oil, you will also need to also order the copper drain plug crush washer. It's pretty hard to find under the fiche diagram for my 800XP, so unless your eyes are a lot better than mine, it wouldn't hurt to ping your favorite Gearhead to help you locate it quickly." 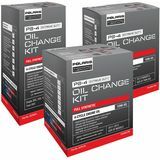 DirtRat - San Antonio, Texas Oil change made easy "This is a kit that comes with everything you need to change the oil. It’s a nice convenient kit Polaris has put together. Makes it easy to buy and change your oil."